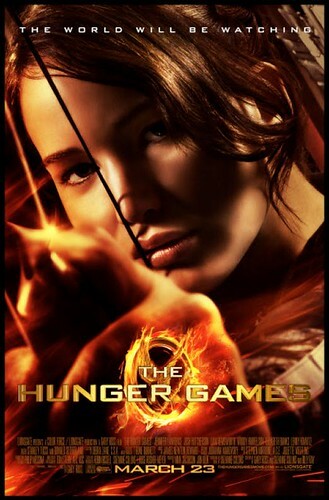 I've seen the Hunger Games film. What follows is a quick-and-dirty list of some of my initial reactions. The spoiler-free nutshell version is this: two thumbs up! 1. It's very apparent that Suzanne Collins was involved in fashioning the screenplay. The changes that had to be made to the story in order to adapt it to the "big screen" make sense and hold true to the spirit of the books. -- The origin of the mockingjay pin has changed. Katniss picks it up in The Hob as a good luck charm for Prim, because Prim is frightened of The Reaping. Prim in turn gives it back to Katniss for her protection once Katniss volunteers as tribute. -- After Katniss brings the flowers to Rue, the people of District 11 salute her, but they don't send bread. This is one of my favorite moments in the novel, so I was waiting for it, but I ended up being thoroughly satisfied by what substitutes in its place: a chilling glimpse of the riots as they begin in District 11. I understand why this was done, and it is extremely effective. -- The muttations in the arena no longer have the faces of individual tributes. Believe me, I was grateful. There's plenty of violence to make this feel gritty and desperate, and the film gives us several "behind the scenes with Seneca Crane" glimpses into how manipulated and intentional the dangers are, so it would've been rather redundant. Furthermore, after Amandla Stenberg's brief but unforgettable turn as Rue, I really, really didn't want to see her face on one of those creatures. -- Peeta's leg injury is dire mostly due to infection, but it's mostly healed by the medicine Katniss picks up at The Feast. He doesn't end up losing it. 2. There are some lovely additions that set the stage for the next film, most of which are short, intense scenes with either/both Seneca Crane or/and President Snow. Donald Sutherland's performance in particular looms large over the picture. Perfect casting there. 3. I can't criticize any of it. Josh Hutcherson is Peeta down to the last breath. Although I originally cast Brendan Gleeson in my head as Haymitch when I read the books, Woody Harrelson completely won me over. Jennifer Lawrence is subtle, understated, and just right. Stanley Tucci steals every scene in which he appears. I initially had reservations about Lenny Kravitz's ability to project the warmth necessary for Cinna, but I shouldn't have worried. And Amandla Stenberg is everything she needed to be. 4. I'd read reviews that suggested the director (or someone, at least) was "Team Gale," and Katniss and Peeta have no chemistry. I disagree. Liam Hemsworth is not at all the man I pictured when I read about Gale, and I'm still not entirely convinced of him as a black-market hunter/trader, but his Gale does have undeniable sparks with Katniss (and a great relationship with little Prim, too). That said, I was sold on the genuineness of Peeta's feelings, as well. The lack of immediate connection between Peeta and Katniss seems absolutely spot-on, considering the fact they are - or, at least, Katniss is - negotiating a tricky "performance" for the spectators and potential donors, always aware of being watched and uncertain of how much from the other is feigned and how much is genuine. The Katniss-Peeta "dance" feels quite authentic. 5. The action isn't sanitized, but it's also not glorified or overdone. I was in a packed theater filled with people who obviously knew the book, and still there were audible gasps at several of the deaths, these scenes were done so well and shockingly. I don't think the film loses dramatic potency for being edited down from the R rating to a PG-13. 6. I wouldn't want to meet Clove in a dark alley. I'm just sayin'. 7. The Orwellian imagery throughout (including President Snow's propaganda film shown before the Reaping and the omnipresence of the Peacekeepers) strongly complements the political themes of the story. -- The "shaky cam" phenomenon (to which I'm usually immune - I had no trouble with The Blair Witch Project or Cloverfield) was over the top at the beginning of the film, to the point I wanted to close my eyes. Fortunately, the camera work became friendlier as the film progressed. -- At several times during scenes in the Capitol (specifically the chariot scene and the tribute interviews), there was quite an obvious discrepancy between the wide CGI-enhanced shots (wow, look at all of those people in that wide-open space!) and the close shots (wow, there are only a couple of hundred extras jammed onto a set!). On the whole, I'm quite impressed with the movie. I'm anxious to see it again soon. I'd be interested to hear other reactions to and thoughts about the film! PS. The Songs from District 12 and Beyond album is quite good! I've just come back from it and I enjoyed it more than the book. I agree that the violence was perfectly balanced. I agree with whoever said (not you!) that Peeta and Katniss have no chemistry -- it felt like a huge flaw to me, I'm afraid. I was very worried at the start when she retrieved her wooden bow from under a log with no oil-cloth to protect it, but luckily, the rest of the film made me forget that. Ha! She needed you to instruct her on proper bow maintenance, I'm afraid. I'm so glad you enjoyed it overall. I'm looking forward to seeing it again, soon. I have a feeling I missed a lot in that first viewing! So do you think it might qualify for an LFS special award next year? Oh, good question! I really do think so, yes. Loved it. :) I'm one of those folks who loves the book and movie differently somehow, so I didn't mind changes...and actually I rather enjoyed the behind-the-scenes glimpses, which were so very sinister and chilling. I agree with you about the changes. They weren't arbitrary; they added to our understanding and fit fully with the spirit of the novel. Oh, one more thought...since District 12 had been Appalachia, I was delighted by how very Appalachian it FELT. Being Appalachian myself, I recognized a lot of the look, and it had such a magnificent authenticity about it...LOVED that aspect most of all. I swear, it was so much fun seeing them filming the District 12 scenes around here, and then being able to pick out all of the locations in the film while I watched it. You're right: it has the perfect Appalachian "feel"! I really admire the way they used the music, too, to create that atmosphere. I'm so glad it passed your "authenticity test" - that's great to hear! I had a few more issues with the movie. My biggest issue is that they did not cast actors/extras to make it look like the people of district 12 were starving. They all looked well-fed, albiet thin. Seeing as both of the tributes from district 11 were black (or were supposed to be), it would stand to reason that there would have been a large number of black people in district 11. It looked like the only black resident was Rue's father. That seemed ironic because, while adorable, the actress that played Rue seemed too light-skinned for how my imagination told me she should look according to the descrption given. I also wondered why they did not take the interviews directly from the book, but changed the wording. Haymitch was too young and too fit for a middle-aged drunk. He did not act drunk enough and was the wrong kind of hostile. Instead of his initial advice in the book (stay alive), he essentially told them to accept the likelihood of their death. Of course, one might call these points nitpicking, but they detracted from the enjoyment of the movie for me. I, too, would have enjoyed the district 11 bread scene. I definitely see what you mean about the relative healthiness of the District 12 citizens. During the District 11 rebellion, though, I thought the majority of the men shown were black, and only a minority were white (maybe 80%/20% - citizens, that is, not peacekeepers). I'll have to look again when I see it next time. The way they did the interviews worked for me, but I agree that it was an interesting choice to make Haymitch switch his advice from "Stay alive" to "Accept the fact you'll likely die." I wonder if that was meant to communicate more about the peril of the games than about Haymitch's character. At any rate, I did wonder about that, too. Good point. As much as I loved the bread scene in the book, getting to watch the rebellion unfold gave me chills. I didn't read your spoiler bits, but I'm very excited to see the movie! May have to wait until next weekend as this is my first weekend home in the last 3 and I have some catching up to do! I also had issues with the shaky camera, especially the first scene with her running through the woods. Other than that once part though, it really balanced itself out. I loved the camera work during the fire scene and the tracker jackers. You're right: the camera work did balance out quite quickly. I'm so glad. I felt dizzy as she went running through the woods! I loved the camera work during the fire scene and the tracker jackers. Oh, good point! Well done in both parts. I can't believe they are only showing the English version here in Germany ONCE this week and who knows if ever again! I can't go tonight so I'm not sure if I'll see it on the big screen, in English (which is a must, actually). Arrgh! As luck would have it they are showing next Tuesday in English as well! And I can go! Yea! Oh, that's very good news indeed. I'm so glad! I hope you enjoy it as much as I did. To my untrained ear, the music is quite impressive, too, in creating a sense of setting. I took your new survey, BTW. Three cheers for Poetry Planet! The fact that it was filmed near you and I've been following it on your blog is of course, of added interest! And thank you so much for taking the survey. I would love to get some constructive criticism too , but friendly waves and encouragement are extremely welcome! I've just come back from seeing the film and was impressed by how well it had been made. I didn't like the book as I think having a first person narrative destroyed the narrative tension for me (it didn't seem to bother other people very much). Going in knowing the storyline took that element of dissatisfaction away. Visually, I thought it was very well done, especially the scenes in District 12 which reminded me of the photographs of James Agee. I also liked the way that the cynicism of those running the games and in power in The Capitol was made clear but in a subtle way. What I felt was lacking, and this is probably due to time constraints, was enough differentiation between the other tributes who survive the initial slaughter at the cornucopia. The viewer is given short hand ways to remember them, but it isn't enough and any feelings of sorrow at their deaths are hard to feel as they are to a large extent cyphers or, dare I say, red shirts! I don't understand any criticisms of a lack of chemistry between Peeta and Catniss as I think the whole lack of a relationship, its growth and the added awkward layer of it being played out before an audience was spot on. For some reason the first person narration didn't bother me. Now I'm trying to figure out why, because you raise a really good point. I suppose I was never all that worried about Katniss surviving; once I understood the premise, I assumed she would and the others wouldn't. (Sort of like going into Mary Doria Russell's The Sparrow, knowing from the beginning that all but one of the characters I was going to meet and care about would be dead or assumed dead by the end, and also knowing which one was the survivor). What got me hooked on the story was the world Katniss described from her outsider's perspective, and wondering what the repercussions of the games would be for the people outside of The Capitol. As she described what took place in the arena, I was always trying to imagine the citizens of the different districts, watching and reacting to what they saw. Hmmm. I'm going to have to think about that some more. I agree wholeheartedly with you about the visual look of the film, especially District 12. Just perfect. I also liked the way that the cynicism of those running the games and in power in The Capitol was made clear but in a subtle way. Yes! This could easily have been over-the-top, and instead it struck just the right note. I also wish we'd had more time with the red shirts - I mean, other tributes. ;) I was very impressed with how much was conveyed in the brief glimpses we got of Foxface and Clove, in particular, and I would've loved to see more of them, as well as the others. As you say, just a little more familiarity would make the deaths all the more meaningful. This. You said it far better than I could. I agree completely! I didn't like the shaky cam either. Rue's death made me cry, and the riot scene following sorted of lifted me out into hope from the tears, so I liked that. There's definitely a lot of things missing from the film, but the spirit is there and it's encouraging people to read the books - and it won't have ruined the books for them. There's definitely a lot of things missing from the film, but the spirit is there and it's encouraging people to read the books - and it won't have ruined the books for them. Oh, that's it exactly. What you said!